Jamie Longazel is Associate Professor in the Department of Political Science at John Jay College of Criminal Justice, City University of New York. His research examines issues of race and political economy, typically within the contexts of immigration and imprisonment. His recent book, Undocumented Fears: Immigration and the Politics of Divide and Conquer in Hazleton, Pennsylvania (2016, Temple University Press), won the North Central Sociological Association’s 2017 Scholarly Achievement Award. 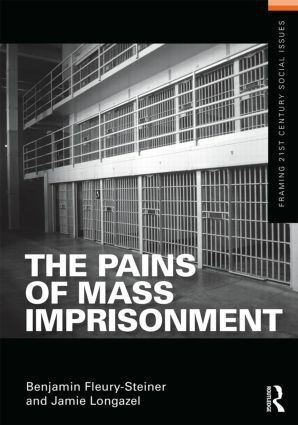 He is also the co-author (with Benjamin Fleury-Steiner) of The Pains of Mass Imprisonment (2013, Routledge). His work has appeared in academic journals across several disciplines, including outlets such as Law & Social Inquiry, Punishment & Society, and Theoretical Criminology. A strong proponent of popular education, since the release of Undocumented Fears he has been working with grassroots organizations on understanding the political economy of anti-immigrant backlash. Longazel, Jamie (2016). Undocumented Fears: Immigration and the Politics of Divide and Conquer in Hazleton, Pennsylvania. Philadelphia: Temple University Press. Fleury-Steiner, Benjamin and Jamie Longazel (2014). The Pains of Mass Imprisonment. New York: Routledge. Longazel, Jamie and Maartje van der Woude (2014). The Negotiated Expansions of Immigration Control. Law & Social Inquiry 39(3). Majka, Theo and Jamie Longazel (2017). “Becoming Welcoming: Organizational Collaboration and Immigrant Integration in Dayton, Ohio” Public Integrity 19(2): 151-163. Longazel, Jamie, Jake Berman, and Benjamin Fleury-Steiner (2016). “The Pains of Immigrant Imprisonment” Sociology Compass 10: 989-998. Fleury-Steiner, Benjamin, Paul Kaplan, and Jamie Longazel (2015). “Racist Localisms and the Enduring Cultural Life of America’s Death Penalty: Lessons from Maricopa County, Arizona.” Studies in Law, Politics, and Society 66: 63-85. Longazel, Jamie (2014). “Rhetorical Barriers to Mobilizing for Immigrant Rights: White Innocence and Latina/o Abstraction.” Law & Social Inquiry 39(3): 580-600. Longazel, Jamie and Benjamin Fleury-Steiner (2013). “Beware of Notarios: Neoliberal Governance of Immigrants as Crime Victims.” Theoretical Criminology 17(3): 359-376. Longazel, Jamie (2013). “Moral Panic as Racial Degradation Ceremony: Racial Stratification and the Local-Level Backlash against Latino/a Immigrants.” Punishment & Society 15(1): 96-119. Longazel, Jamie (2013). “Subordinating Myth: Latino/a Immigration, Crime, and Exclusion.” Sociology Compass 7(2): 87-96. Longazel, Jamie, Laurin S. Parker, and Ivan Y. Sun (2011). “Experiencing Court, Experiencing Race: Perceived Procedural Injustice among Court Users.” Race & Justice 1(2): 202-227. Sun, Ivan Y. and Jamie Longazel (2008). “College Students’ Alcohol-Related Problems: A Test of Competing Theories.” Journal of Criminal Justice 36(6): 554- 562. Longazel, Jamie (in press). “Racing the Oven Bird: Criminalization, Rightlessness, and the Politics of Immigration.” In Insiders, Outsiders, Injuries, & Law: Revisiting the Oven Bird’s Song, edited by Mary Nell Trautner. New York, NY: Columbia University Press. Longazel, Jamie and Maartje van der Woude (2014). “Introduction to: The Negotiated Expansions of Immigration Control” Law & Social Inquiry 39(3):555-559. Longazel, Jamie and Benjamin Fleury-Steiner (2011). “Exploiting Borders: The Political Economy of Local Backlash Against Undocumented Immigrants.” Chicana/o Latina/o Law Review 30:43-64. Fleury-Steiner, Benjamin and Jamie Longazel (2010). “Neoliberalism, Community Development, and Anti-Immigrant Backlash in Hazleton, Pennsylvania.” Pp. 157-172 in Taking Local Control: Immigration Policy Activism in U.S. Cities and States, edited by Monica Varsanyi. Stanford, CA: Stanford University Press.